Old products that need to be thrown away. I actually weed out products of this kind pretty frequently, but I'm probably not as cut-throat about it as I should be. Lightly used products that can be given to family/friends- includes certain discontinued/limited edition things that just aren't relevant to my videos right now. Hall of Fame products - a small bag for those "sentimental" awesome products that I don't want to part with-- but at the same time, they don't need to be clogging up the drawers in my collection. Fails/Future Reference - a small bag for products with notable downsides, and some products that have some sort of distinctive quality that could be useful for comparisons/reviews down the road. Once I complete this process, I'll probably share some pictures, but so far one of the categories I've been through is my eyeshadow collection. I stumbled across so many old products (purchased anywhere from 2000 to 2006ish)... and I thought it would be fun to share some of my MUST HAVES from back in the day... you may remember some of these from my earliest YouTube videos! I'm not going to throw these away, and I actually have this vision of doing some sort of magnetic "makeup hall of fame" board in my closet with this stuff. But anyway-- these shadows were my favorites back then, and hundreds of reviews later, I still think they're awesome! I believe this product was among some of the first high end makeup I ever had. My sister Kelly a.k.a. Pup got me a little Smashbox set for Christmas (many years ago), and I remember using this trio constantly in my early news days. The shadows feel so buttery and smooth. There's quite a dent in the plum shade, and I remember how incredibly easy I thought these were to blend. 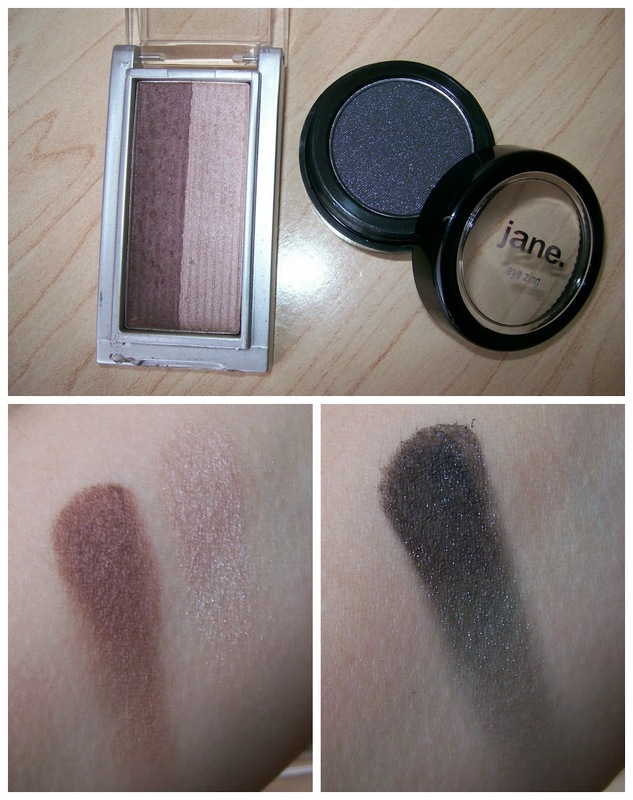 My all-time favorite Jane eyeshadows! I think that Red Rocks duo was even an Emily Award winner back when that series began. That matte plummy/brown was the BOMB. Also- who didn't love the Jane Eye Zings?! These were next-level drugstore eyeshadows, and Clubbing was my smokey eye must have in COLLEGE. It takes commitment to totally use up a black eyeshadow, but I accomplished the task with this bad boy. The one in the picture is actually new, because last year Hautelook was randomly selling old Jane stuff, and, you guessed it- for "sentimental reasons"- I needed to buy a new one. 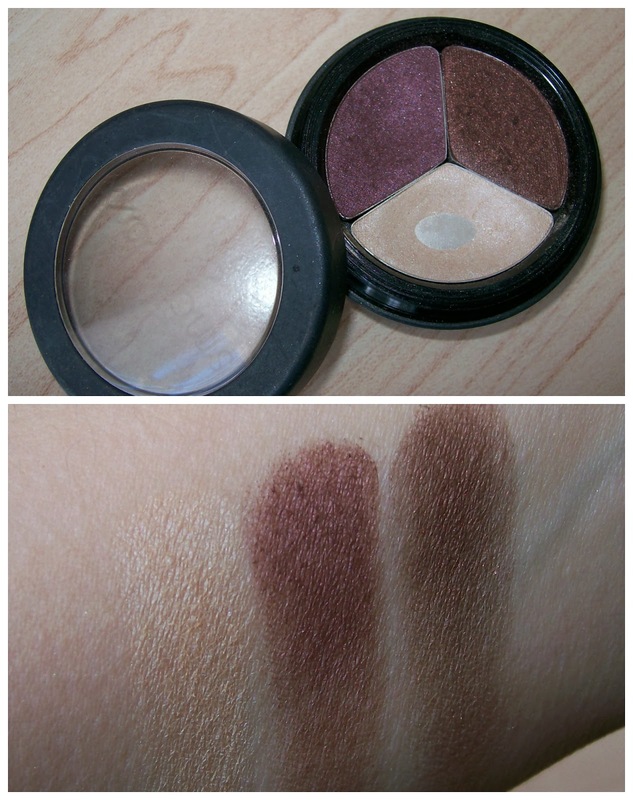 Before Wet n Wild was making it's fabulous Color Icon palettes, the brand was much more hit & miss... but this particular shadow was a total hit, and it was a cult favorite on the first makeup-related websites I remember going to (MakeupTalk & MakeupAlley). This shadow was gorgeous rose gold before rose gold was cool! 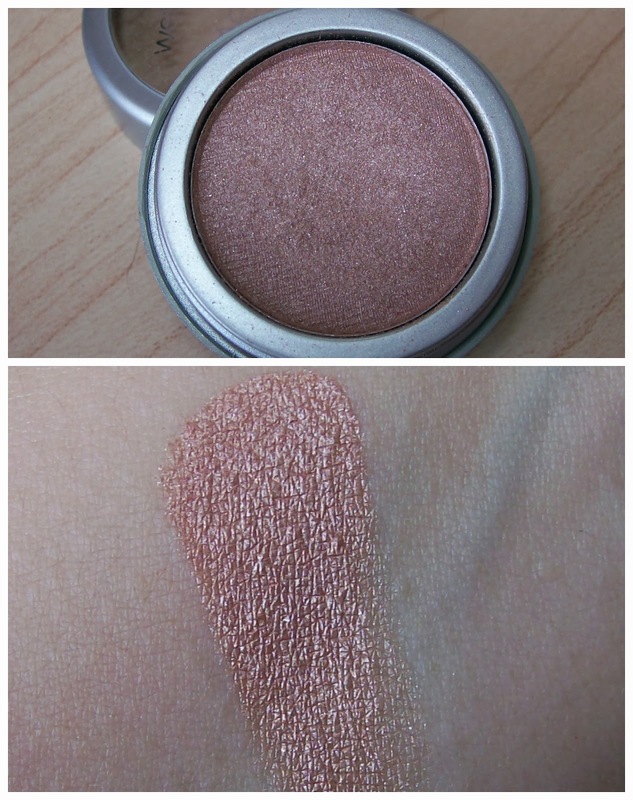 :) The texture is impeccable and as good as any high end shadow I own. Ok, now it's my turn to ask you... what kind of old makeup is lingering in your collection? Do you find yourself holding onto products just because you associate them with something special? Thanks for checking out this post, and I'll probably do some updates on my makeup purge/reorganization! Had a great time today on Beauty Broadcast Live! Thanks to those who joined in the fun! Yesterday I did a blog for the Ladies' Home Journal Gloss Daily site- it's on some cool multi-colored powders! My super dry feet are making a comeback. After tonight's shower, I think some heavy lotion and socks are in order! That Wet N Wild Fine Wink one looks gorgeous! I have a lot of loose mineral eye makeup that I don't use. It was way popular to use loose mineral makeup back in college for me but I don't use them anymore. Should do the same and weed through my stash! I think the only thing I am holding onto is the ONLY eye shadow 'palette' I ever used up until I started collecting last year. And that is the covergirl one for green eyes. I was obsessed. One of the only products I ever hit pan on. haha. You should try the Freeman Peppermint + Plum foot scrub for your feet! It is AMAZING. My feet were super dry and I used it for the first time, made a huge difference. JUST last night I pitched 2 fairly old Laura Mercier eye shadow singles - some of the least pigmented I own, so out they went! WnW fine wink is awsum <3 Wana follow each other dear? Do lemme know! I have an old L'Oreal trio in Bois de Rose I think. It's all matte, a pretty pale color, a brown and a pinky shade. I stole if from my sister when we were teenagers. I am now 55. OMG! HAHA!! I still use it sometimes. Major pan but it's still PERFECT. I'm definitely an eye shadow hoarder...everything else I can let go of. Back in the day, I used to think Clinique eye shadows were the only ones worth having, so I'd save up and buy them when they had the Bonus Gifts! I still have most of them because they were hard-earned and well-loved! with a teenager in the house, and my limited space, I can say my collection is well combed through often LOL I only have too many older Bare Minerals eyeshadow pots sitting around but only because they take SO long to work through and my DD only wears very light colors. 1. What is your favorite coffee brand? 2. what is a good foundation for a pale person? mine makes me look like a ghost. 3. Have you bought and tired a curl secret from Conair? 4.Last one can you link a link to all your blogs, channels and social network pages. please. I wish that Wet N Wild still made that shadow. It looks so pretty. I have a whole slew of products that are in that ok-workable-not-great-but-not-crap category that I can't manage to throw away. An old Maybelline 8-pan palette that I can't remember when it was bought. A slew of Ulta brand eyeshadows I got during a buy one get one when I first began discovering makeup outside the drugstore (about 10 yrs ago). I'm finally finishing up a concealer that I bought at least 10 years ago. I have an old Covergirl single that is BROKEN, and that I never use, but I wore it all the time when I was a freshman in college 14 yrs ago. But I'm not really sentimental about products, I just hate knowing I spent money on something I didn't use up. ( sheepishly she admits ) I bought Milani's Java Bean not long ago at Dollar Tree. It is one of my favorites. Miss Crystal inspired me, too, to take inventory and I found that I have some old Maybelline shadow singles hanging around and I'm not sure why. If I were shadow shopping today I wouldn't buy them so I don't know why I keep them. I have a worse habit of stockpiling back-ups when I find something I like. Then when I inventory the back-ups I realize I need to slow down because I have a dozen of them! I have Milani Flare and Java bean and I love them both. Wish I could get some more. I have been holding onto a shimmer stick that Bath and Body Works used to make like a million years ago! I really wish they would come back out with those. lol. Oh wow, loads of wonderful old favorites I spy here! Some of my old favorites are from Estee Lauder, an old palette my mom gave me over 5 years ago....the color is still vibrant in them! I was just weeding through my collection and unearthed a collection of bare minerals Glimmers and some other bare minerals shades in their pots some went unused ;-( . I hate to throw them away but I'll never use them. I wish there was another use for them. I also found some Maybelline Eyestudio (Silver Starlet and Ivy Icon) singles. They're the ones that look domed and baked. Didn't like them. Oh well...making room for more goodies! I have limited space in my makeup drawer so I throw things away or give them to my mother if it's something she'd like to use or my younger cousin just so she can play with it and figure out what "works" for her - she's a beginner in the makeup world :D I like to make more room for my drawers so I can buy.. new products! Also I'm tired of hearing my mom say "You have too much makeup!" I had Clubbin' i loved it so much. Read more about Dermal Fillers Delhi. I got through and give away and throw stuff away frequently. But I do need to have a "come to Jesus meeting" with some of my shadows. I have 4 drawers (10 drawer cart) with single powder and cream shadows along with palettes as well as loose Bare Minerals shadows. *sigh* Never ending struggle. OMG ~ I just love that Smashbox trio! I were it were still available!! I have one of those milani singles in almondine. I love it. It's the perfect, smooth, almost creamy light vanilla that I use to blend and buff out many shadows. It's matte, so that's cool. I also keep a max factor superlash mascara (I don't use it, obviously), but I have been intending to clean the brush completely and sterilize it so I can use it with other mascaras. It has the weirdest shape, but it worked for me. I really need to start doing this. My hoarding comes in with mascara though. At least eye shadow has a bit of a shelf life. oh man i never bought much from jane cosmetics but i had... er... still have this BRIGHT sky blue eyeshadow that seriously was amazing... obviously before using primers and bases and what have you... like probably 6th grade me thinking OH COOL BLUE MAKEUP.. i loved it. barely used it but loved it. i find it hilarious that blue eyeshadow was my first memorable purchase [in powder and pencil form, that i bought with my own money and not just handed down from mom] and i own a ton of blue shadows and pigments and yet, blue is not my favorite color on myself makeup wise. 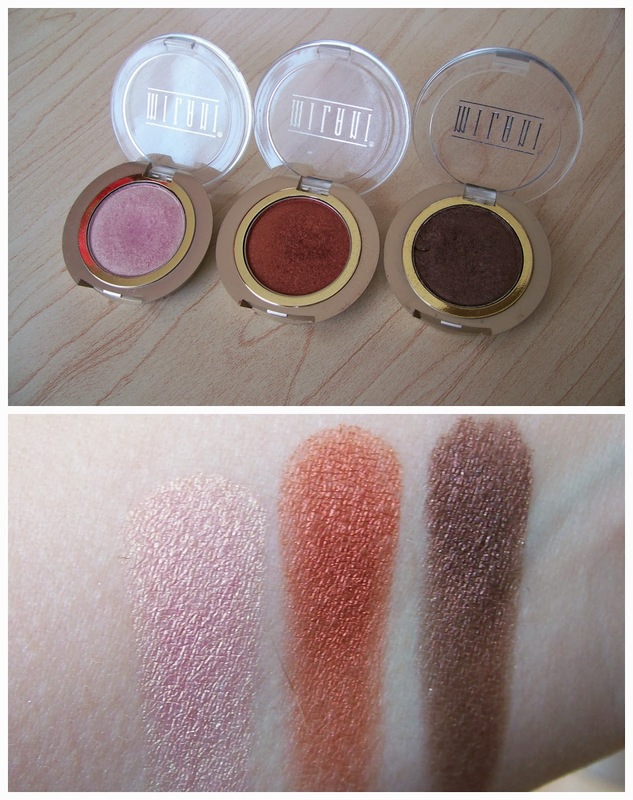 Those Milani eyeshadows are so beautiful! Are you still working on this decluttering project? I've recently been obsessed with decluttering/Project pan videos.